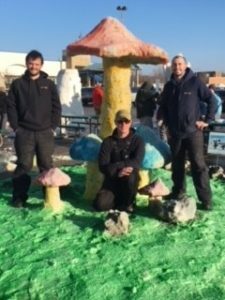 On January 27th, WOW-WE CARE CHARITY sponsored a team of employees from WOW Logistics™ Wisconsin Rapids facility to compete in the 13th Annual Souper Snow Sculpture Spectacular to benefit South Wood County Humane Society. Even after their sculpture collapsed just two hours before judging, the team was able to complete their entry right on time and place 5th overall. Since many WOW Logistics™ employees make regular donations to WOW-WE CARE CHARITY, we make it a priority to enable them to support the organizations which are important to them.